We are sorry to report that one of our long term FFGR, Inc. families, Jackie and Scott Grove, have lost their beloved hound. Guv was only nine years old but had fought a number of battles in his life. 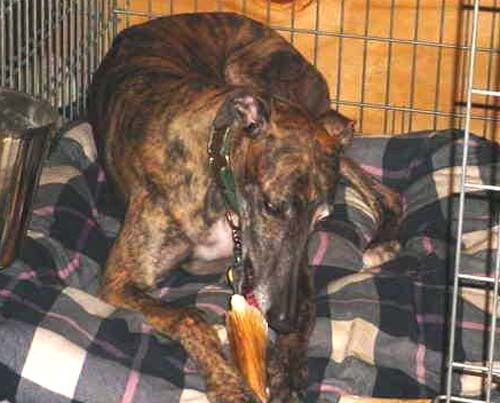 He got through a long battle with fear aggression brought on by him being crated 22 hours a day. He managed to battle through seizures and hang on while Jackie and Scott dialed in his medications. He was seizure free for five years. The one thing that Guv could not battle back from showed itself one night recently……Osteo. Guv started limping and by the next morning he was three-legged lame. Jackie managed to get him to let her feel the leg and she found a spot above the wrist that was not right. After x-rays at the vet the answer presented itself – serious bone changes and the beginnings of the dreaded swiss cheese look in the femur. Jackie discussed with the vet the options for this warrior and they both agreed that with his history of seizures, amputation or chemo would be difficult if not impossible. With all the love they could pull together, they held him and let him go releasing him from any more pain. Guv was much loved by our group. He attended many many meet and greet events over the years once he got over his fear. We were all proud of him and cheered for him when he became such a calm and sweet boy. He may have never had a chance had he not been adopted by Jackie and Scott. They took the time and patience and worked with him and the result was a very happy and healthy dog. Even though Guv will be greatly missed by his family (and all of us), we all are grateful that he had such a wonderful home. Run free Guv; we will all meet some day at the bridge.